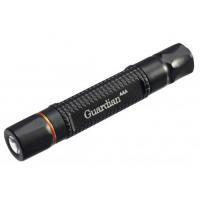 The Guardian AAA Flashlight from ASP is a lightweight light designed for portability. Intended as a backup option for a more powerful light, it can also be used on its own effectively. Its durable aluminum body measures less than three inches long and weighs under 1.5 ounces. A Cree XPG2 LED provides 80 lumens of illumination on the high setting, and also offers a battery-saving low power mode for close-up work. It can be operated one-handed easily using a single tail switch. The flashlight also contains an advanced Thermal Management System that regulates the electronics to provide a sustained output and prevent overheating.